So I've just ordered some new models to help give some impetus to my motivation. I ordered the Slithe Queen, some Slithe Queent, some Slithe Raiders (to see if they fit the bill for Sprats ie. Coral Hunters / Crest Riders) and some sea creature familiars (all from reapermini.com). I'm thinking of creating some new kind of Sea Creature swarm unit and I also like the idea of possibly using some of the sea creature familiars as icons on the top of standards - I'll have to see how large they are I guess (I wish they would advertise miniatures next to a ruler so you can see exactly how big they are). Images are used with the permission of Reapermini.com who have kindly granted me permission to post any miniature images from their site for the purpose of my Nautican Army project (I have purchased quite a lot of minis from Reapermini.com and can thoroughly recommend them for price and reliability). 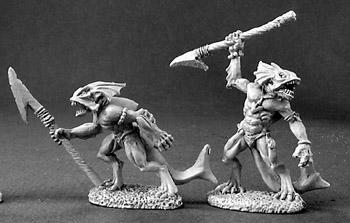 Oh hey, Drac again, you might have not seen this, but I've pretty much 'fishhed'' out every Aquatic miniature from Reaper Miniatures. Oh, and as for the Slithe Queen, will you be using the profile of the Sea Dragon, tweak the Sea Dragon profile a little bit or change it completely?